1. Pre-heat grill to medium-high. 2. Shuck and clean corn. Don't worry about getting every last stray piece of silk—they'll burn away on the grill anyway. Place the corn directly over a very hot fire and grill, turning occasionally, until charred and cooked through, about 10 minutes total. Set aside until cool enough to handle. 3. Slice zucchini and tomatoes and place in a large bowl. 4. 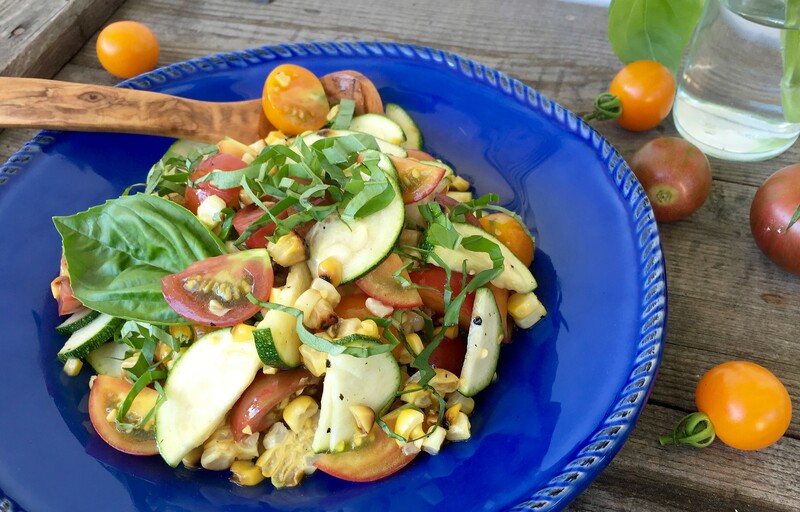 Cut kernels from corn cobs and add to bowl with zucchini and tomatoes. 5. Combine dressing ingredients in a glass jar with a tight-fitting lid and shake to combine. Alternatively, whisk together in a small bowl. 6. Pour dressing over vegetables. Add basil. Stir to combine.